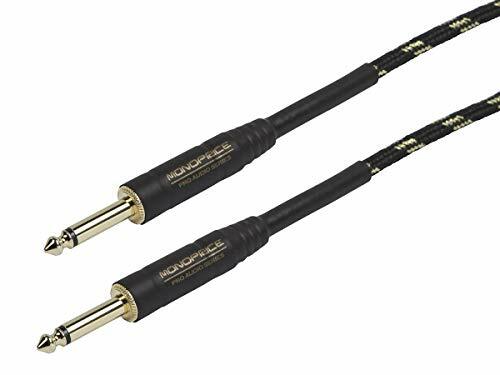 Get a great sounding, no-noise guitar/studio recording instrument cable when you use this Cloth Series 1/4; TS Male 20AWG Instrument Cable from Monoprice! This cable is constructed using a 20AWG solid conductor, surrounded by two layers of copper braid shielding, that produce 99% shield coverage. The cable features gold-plated connectors for smooth, corrosion-free connections every time. The black and gold braided cloth jacket provides superior durability to traditional plastic jackets.